Lately it's been all about the Little Red Hen at our house. I'm not really sure why-- you'd think the kids would want to escape the pattern of someone asking for help (me) and others denying that help (them). Paul Galdone, has a lovely (of course) traditional version and we've it read over and over. Don't think I'm weird, but my favorite part is how he put the faces in the not I's. Also, the hen's "I'm going to eat it!" angry face is pretty much spot on, don't you think? 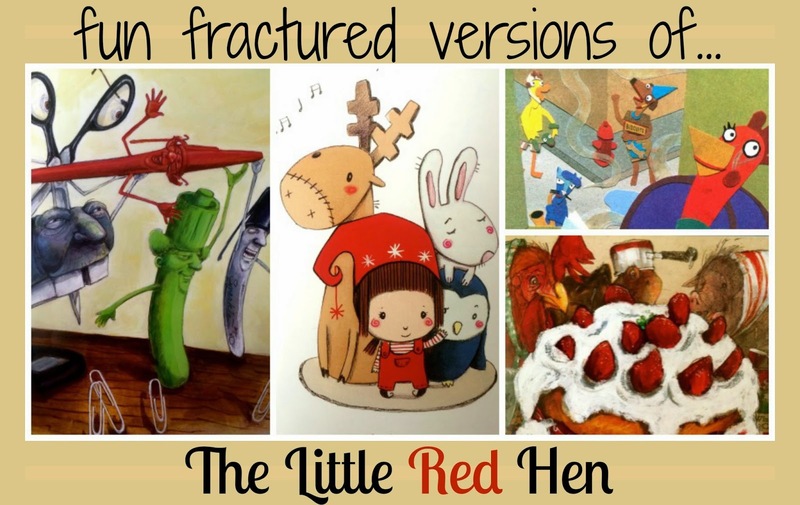 And, since my kids and I are all suckers for a fractured fairytale we've read quite a few mix up versions of The Little Red Hen too. The Little Red Pen by Janet Stevens and Susan Stevens Crummel was a new one for us. It's inventive and definitely untraditional. The red pen needs help grading papers but the other school supplies aren't interested (of course) until the pen falls into THE PIT OF NO RETURN (the trash). They band together and launch a rescue mission! The Little Red Elf by Barbara Barbieri McGrath has been a HUGE hit around here. Cuteness is pretty much obsessed with this one. The unhelpful friends' (a reindeer, a penguin, and a hare) responses in this one are hilarious and the Little Elf's can do attitude is fun and funny too! I wish we could have found The Little Green Witch by this same author…. I must make a mental note to look again next time I hit the library. The Little Red Hen (Makes a Pizza) by Philomen Sturges is the book that set this whole red hen reading fest in motion. I like the funky cut paper illustrations and the hen's eclectic style and slightly scatter brained tendencies (she goes to 3 different stores all just to make this one pizza) make her endearing and relatable…at least in our house. 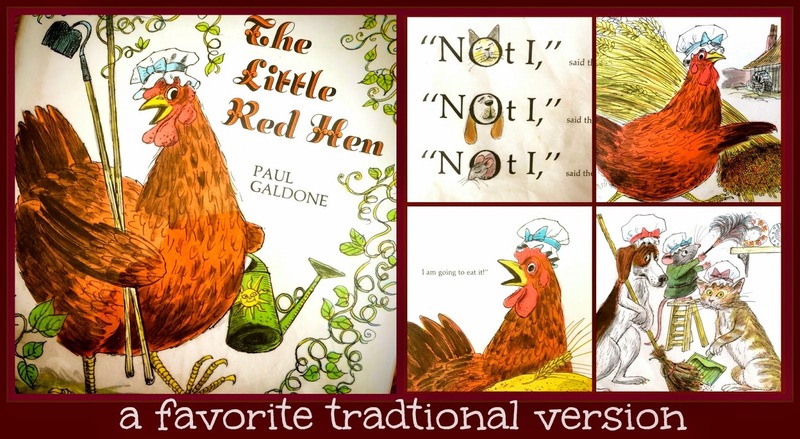 And of course this list would not be complete without the mother of all red hen parodies, Cook-a-Doodle-Doo! (This one is also by Janet Stevens and Susan Stevens Crummel-- they must have a thing for this particular story.) Hopefully you are well aware of the adventure and antics happening all through this book as the little red hen's great grandson tries to make strawberry shortcake with a few new barnyard friends. Plus there's lots of math and cooking fun & a recipe in the back! So, any Little Red Hen versions you think we need to see? Also, I'm taking an informal poll: at the end the this fairytale do you prefer the hen to cave and end up sharing what she's made, or do you like it better when she eats it all herself? Just curious.